The Elementary Summer Literacy Camp is designed for 6 to 11 year-old children. We have a total of 9 sessions (including the lunch session) running every day starting at the end of June until the end of August (for 9 weeks). Students must enroll for a minimum of 6 weeks of summer classes. If there is a vacation planned or the student has a sport camp or any other summer activities scheduled, parents must notify the program director by the first payment deadline to have the child’s tuition adjusted accordingly. However, the total tuition of the child cannot be less than 6 weeks of classes. Our goal at Basic Steps Learning Center is to provide parents flexibility as well as the opportunity for your child to continuously learn when school is on break. According to many research studies, many children experience summer learning loss (read more about it here). To keep your child actively learning over the summer, we customize the curriculum based on your child’s needs. We could also work with your child’s teacher before the summer program starts and put together assignments that will help your child reach his/her learning goals. Your child will be learning in a group tutoring setting, where each individual has their own learning goal. We have a ratio of 1 teacher to 8 students and a maximum class size of 16 students. 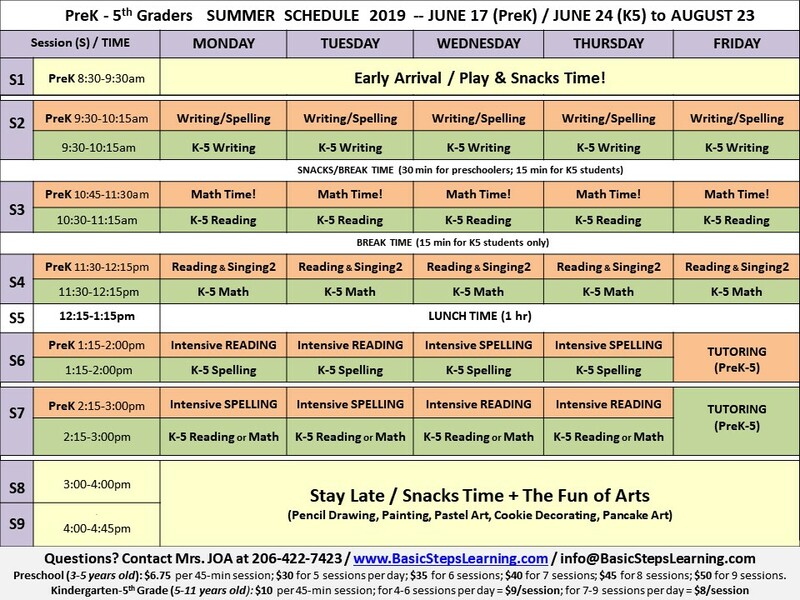 Click on the picture below to view our summer schedule.